Still no fabric :( Thank you all though for your encouraging comments. One of the sellers has offered to resend the fabric, but I am not sure if that is right as it's not her fault it went missing in the post. What would you do? 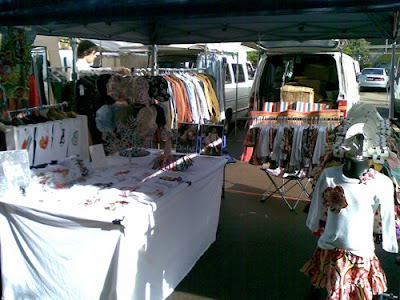 I was going to take a lot of photos at the Bondi Markets last week but of course I forgot to bring my camera. I took one photo on my mobile phone so that you can see my new market canopy. I was super excited to finally have one - I'm in the big leagues now! It also came in handy when it started raining and when I had to pack up early because there were no people left at the market to buy anything, lol. It was nice to pack up my stuff under cover. 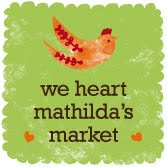 I am not going to be at Bondi Markets this Sunday as I am trying to get ready for Mathilda's Market. So much to do and everything always takes longer than I anticipate. Anyone know where I can get my hands on a cheap cloning machine? If necessary, I'm sure you'll make it up to them in future orders. I hope that things aren't too crazy for you. 1 week until show time! !